London – 18th May 2018 – Reapit Ltd, the preferred platform that successful estate agents use to run and grow their businesses, has completed the acquisition of Resource Techniques Ltd, the specialist estate agency software, web design and online services company. 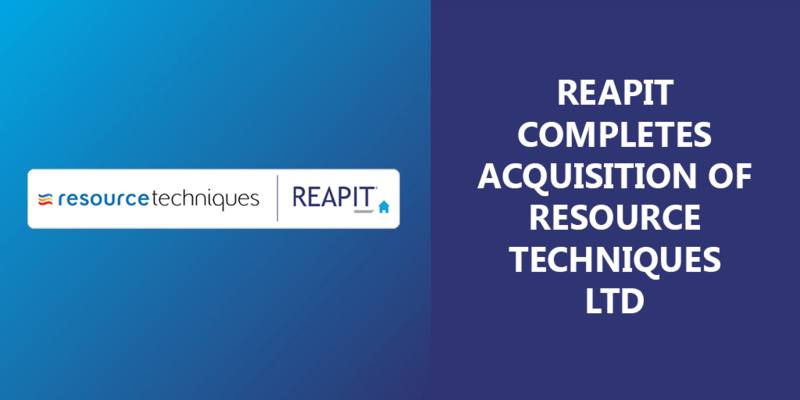 The acquisition will strengthen Reapit’s core market share in the UK. Resource Techniques will continue operating from their current headquarters in Hendon, West London. Reapit will be seeking to expand the range of website and online services it can offer via Resource Techniques. The digital solutions that Reapit has developed to compete with hybrid and online agencies will also help to strengthen this aspect of what Resource Techniques offers to their clients. In addition, Reapit will make available its award-winning RPS CRM platform to Resource Techniques’ clients with the aim of ensuring they all receive the very best solutions and service for their businesses. Reapit is the preferred platform that successful estate agents use to run and grow their businesses – from sales to lettings, front office to back office, and everything in between. Its combined solution (RPS) has been repeatedly recognised for excellence, winning numerous industry awards. Reapit has underpinned its software with a strong service and training ethos which has helped to attract and grow many leading brands including: Savills, Knight Frank, Romans, Marsh & Parsons, CBRE, Countrywide and Winkworth to name just a few. The business provides software solutions to over 20,000 users worldwide and employs 150 people across its five offices in the UK and Australia. Reapit’s Client Accounts software is accredited by the Institute of Chartered Accountants (ICAEW) and NALS. JET Software Ltd also forms part of The Reapit Group and acts as Reapit’s exclusive reseller. JET delivers a pre-configured version of RPS that has been tailored for entrepreneurial agencies. Since being founded in 1989, Resource Techniques has evolved into specialist Estate Agents software, web design and online services company providing over 3000 estate agents with a diverse range of services. The web department at Resource Techniques employs the latest internet technologies and strategies to ensure that customers’ websites appear high in the search engine rankings enabling them to have maximum exposure. Resource Techniques are a highly respected provider within the industry and are preferred suppliers for membership organisations such as TEAM Association and The Mayfair Office. And see what other agents are raving about. Find the gold in your database.